The 21 cockle pickers who were killed in Morecambe Bay in February died from drowning, an inquest has heard. Among those who perished were an 18-year-old man and a husband and wife, Lancashire Police revealed on Tuesday. Twenty of the victims were from the Fujian province, and one was from the Liaoning province. The inquest, held at Lancaster Magistrates' Court, was adjourned to a later date to allow criminal proceedings to be completed. 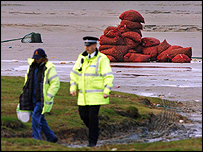 The police team that identified the victims told coroner Howard McCann they believed 23 people died in the tragedy, although only 21 bodies were recovered. Mr McCann commended authorities in Morecambe "to the highest level" for their actions in the days after the tragedy. "I'm happy that this morning's proceedings are finished. I'm pleased that we have managed to get the identification inquiries completed," he said. Adjourning the inquest until a later date, he also paid tribute to the work of the those who rescued 15 survivors. He said: "The events as they unfolded must have been a harrowing experience for the survivors of the tragedy, those involved in the rescue and those involved in the aftercare." The victims' bodies may now be sent back to China to be buried. Xin Yu Hua, 37, died in the tragedy alongside two male cousins - Lin You Xing, 38, and 36-year-old Lin Guo Guang. His wife, Liu Qin Ying, 37, is also believed to have died but her body and that of another man has never been found. Detective Inspector Steve Brunskill, who led the Lancashire Police team which identified the dead, told the inquest another victim had contacted his family on the night he died. Guo Bing Long, who would have been 29 on 24 June, telephoned his family at 2130 BST on 5 February to tell them he was trapped in the sea. His possessions - including photographs and a white metal cross - were found on his body and later identified by his family. Mr Brunskill also told the inquest the full scale of the disaster was not realised until 0328 BST when an RAF helicopter recovered the first body. The bodies of 17 men and two women were recovered by 1415 BST on the Friday and taken to the Royal Lancaster Infirmary while two more bodies were found in a decomposed state on later dates. Mr Brunskill said the victims had been identified using DNA samples, medical records and possessions found on their bodies. These included 36 fishing permits, many of which contained false information, he added. Officers from Lancashire Police had flown out to China in April to interview families of those who were believed to have died. They collected DNA samples and showed relatives recovered property and post-mortem photographs. Detective Superintendent Michael Gradwell said six people were still being investigated over the deaths and inquiries were continuing in the UK, Europe and Asia. He said: "I have been liaising closely with the Crown Prosecution Service and I have provided them with a substantial file of evidence." They remain on bail until early next month when a decision is expected from the CPS on whether they will face charges. DS Gradwell said there were more than 100,000 documents in the incident room, of which many still needed to be translated into English. Yu Hui, 34, who was married with two sons. Chen Mu Yu, 30, married with one eight-year-old son. Guo Nian Zhu, 39, who was married with one son, aged 15, and two teenage daughters. Lin Zhi Fang, 19, single. Xu Yu Hua, 37, married. Police believe his wife was also killed in the tragedy but her body has not yet been found. His cousins, Lin You Xing and Lin Guo Guang, also died in the waters. Wu Jia Zhen, 36, married with a son and a daughter. Wu Hong Kang, 34, married. Xie Xiao Wen, 41, married with a son. Lin Guo Hua, 37, married. Guo Bing Long, 28, who was married with two children. Zhou Xun Cao, 38, married with a son. Lin Guo Guang, 36, who was married with a son. Cao Chao Kun, 35, married. Guo Chang Mou, 18, single. Yang Tian Long, 33. He was separated from his wife and left behind a 15-year-old son. Wang Min Lin, 37, who was married with a son and two daughters. Lin You Xing, 38, who was married with a son. Police found his body weeks after the disaster on 5 February. Chen Ai Qin, 39, was widowed with a son and a daughter. Zhang Xiu Hua, 45. She was married with a daughter, aged 15, and a son, aged 22. Wang Xiu Yu, 27, who was married with a daughter and lived in Liverpool.